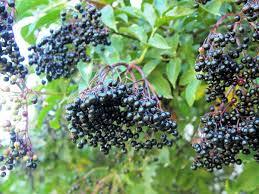 Elderberry refers to a variety of flowering plants of the Sambucus tree belonging to the Adoxaceae family. The most common of this species- and from which I’m sure you’ve found this plant before- is the Sambuca nigra. This variety of Sambuca grows up to be about 30 feet tall; producing soft cream coloured flowers and dark blue-black berries that grow in clusters. 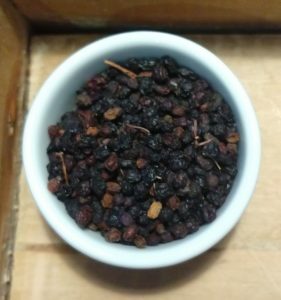 The berries themselves must be cooked to be eaten and are rather tart; whereas the flowers, can be eaten raw or cooked, and is found most commonly in tea blends. The reason it must be cooked is due to the high astringency level of the plant, which contains a kind of anti-nutrient that under certain conditions can be toxic. By cooking the berries, it neutralizes the acidity level, and benefits by enhancing Elderberries unique flavour. 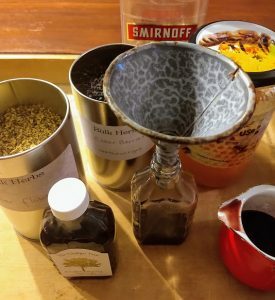 Throughout history, Elderberry has been prized as a remedy for influenza. Native Americans typically used this plant for infections; while Egyptians saw it useful for treating burns and improving their complexion. With its high concentration of Vitamin C, dietary fibre, and antioxidants in the form of phenolic acids, flavanols and anthocyanins, it remains no wonder it is still used so widely today. The flowers are particularly rich in flavanols, noted for their circulatory health benefits. There have been many studies today proving the positive affects on cold and flu’s, with relief in symptoms as soon as 24hours with regular use. 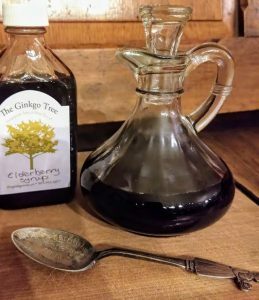 Most commonly found as a syrup, it can also be used as a tincture, lozenges and is a frequently added ingredient in herbal supplements for immunity. With that, it is best to take just before you feel an illness coming on, or when your immune system is being compromised under stress. Hope you enjoy and have a healthy winter! 1. Combine the berries and herbs with cold water in a pot and bring to a boil. 2. Reduce heat and allow herbs to simmer for 30 to 40 minutes. 3. Remove from heat and mash the berries in the pot. 4. Strain the berries and herbs through cheesecloth and squeeze out liquid. 5. Add honey and gently heat mixture for a few minutes. Do not boil! 6. Turn off heat and let cool slightly. 7. If using, add alcohol and stir until well combined. 8. Bottle in sterilized glass. Thanks for this. Just thinking, isn’t it amazing that we actually do have a natural cure for the flu. Did you use dried or frozen berries from last summer? I wish I had been at the workshop. I would like to be sure I am identifying the correct flowers and then berries this summer. Way to go for what you do.